I must have had my head in the sand again this week because I didn’t know that Hans Reiser had finally taken the cops to his ex-wife’s body until I saw an actual newspaper yesterday. I always believed he was guilty, but was surprised to notice myself finally let go of that possibility that she was still alive, that she might be reunited with her children again. I had no idea part of me still hoped for that, but it was deeply sad letting it go. I also did not realize how many people actually thought he was innocent. The people I know close to the case were on what I think is now fair to call Nina’s side. The Reiser kids went to Clementine’s preschool; some of her teachers had also been the Reiser kids’ teachers, and the parents and teachers at Grand Lake Montessori were, to my knowledge, unanimous in their belief that Hans had killed Nina. I never knew Nina or her kids. Her younger child overlapped with Clem’s tenure at GLM by a few months (the daughter had left GLM for elementary school right before Nina disappeared), and my only knowledge of them being there was Chris remarking on seeing Hans in the parking lot during one of our first weeks at the school. He knew of Hans through the software community, and after told our friend Jon (who knew Hans at UC Berkeley) that Clem was in school with Hans Reiser’s kid. When Nina first went missing, I remember seeing an article online about a missing Oakland mom, and clicked through not knowing anything about her. The next day, there were flyers in our parent boxes and emails from the school urging us to look for Nina or to come forward with any information that might help locate her. As the days went on, the school really mobilized. They organized several searches for her in the hills, raised money for billboards asking for information, and when Hans was indicted, continued to raise money for her kids, before they left for Russia. To be part of the GLM community during this time was to witness surreptitious hallway conversations among parents who knew the Reisers, whispered in a sort of code language that developed to keep our children from knowing what we were talking about. The school director reminded parents on more than one occasion how traumatic the idea of losing one’s mother is to a child, and that the kids should be shielded from any knowledge of the case. But it was impossible not to talk about it; parents, teachers, and administrators were being interviewed by the police, and later testified at the trial. I recall showing up to volunteer at the Book Fair one time and the adjoining rooms were being used to counsel some of the teachers who’d testified at the trial. It had been very stressful for them, and the school had brought in a therapist to help them decompress from the whole experience. The consistent message from the GLM parents and teachers was that Nina would not have run off and left her children (Hans’s explanation for her disappearance was that she had gone back to Russia or Europe). I think this spoke to both the parents’ impressions of Nina as an individual, but also to a sense of our identity as a community: such an act by “one of us” was unthinkable. 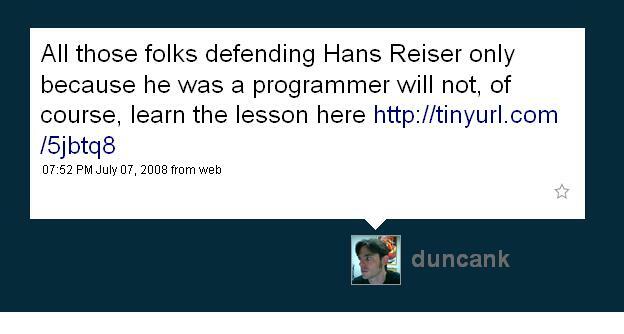 Obviously some in the open source community similarly did not want to believe one of their own had committed murder, and held out a belief that Hans was innocent despite what our friend Ocean pointed out was an almost comical litany of condemning evidence, right down to the books on murder investigation Hans purchased after she disappeared (which should have silenced the argument that Hans was too smart to have committed murder right there). As to the many geeks who vehemently defended him, my theory was that they, also being socially inept, saw themselves looking guilty if ever accused, and my advice to them was (and is) not to kill their wives and they’d be fine. I will be looking for contrition from those guys on the Wired boards, and do not expect to find any. Indeed, Hans is just an ordinary sociopath and narcissist. His crime says nothing about geeks, Asperger’s Syndrome, or the open source movement; nor does it say anything about the virtue of Oakland Montessori mothers. I don’t think the murder even qualifies as a tragedy in the Greek sense; Hans was certainly no noble hero with a fatal flaw, and while Nina may well have been a noble person, I think she was pretty clearly, no matter how unfashionable the term, a victim. With no sociological trend at stake and no “lesson learned,” I am left where I started: deeply sad. By all accounts but Hans’, those kids had a loving and nurturing mother, whom they last saw when they were only 4 and 6. Unfortunately they also had a father whose final words to the jury that convicted him were “I’ve been the best father that I know how.” If that’s true, that’s even sadder. I’ve been reading Groundswell (along with 3 or 4 other books simultaneously, which probably isn’t healthy) and while it definitely lends itself to skimming in parts, it’s a solid, useful book and I’ve been thinking of buying it in bulk to leave around the office. I was shocked, and then not, to hear that the author, Charlene Li, who has also been a speaker at Web 2.0 Expo, is leaving her employer. Forrester has bent over backwards to be accommodating and flexible, but in the end, I have decided that I need to have greater control over how I allocate my time between work and family. As any working parent knows, there’s no such thing as balance – only a series of compromises on both the work and home front. After my crisis about the Europe trip (which went well, by the way, despite it’s brevity) I’ve been domestically inclined. I’ve gone from blogging quite a bit on the work blog in the spring, to a short flurry of posts here, to nothing in the past weeks. Not that work has shrunk its footprint in my life; there’s been plenty going on with putting the finishing touches on our New York event, planning for Europe in October, and thinking ahead to 09…yes, the planning starts now, or at least planning for the planning. But with Chris pulling back-to-back all-nighters for weeks now, it’s just me on the homestead, so some focus is required. The “balance” shifts. Anyway, good for you, Charlene. You have options. You’re using them. I bet whatever you do next will be just as significant and useful as your recent achievements, and now you’ll be in the drivers seat. I’ll take inspiration not only from your insights into the business potential of social technologies but also from your frank assessment that the search for balance is futile. When I first moved to San Francisco, my roommate Wey Wey, who has the most beautiful voice ever, would play guitar and sing in our Mission apartment. Her singing was enchanting and I always felt totally blessed to be near her, but it was also unintentionally hysterical when she would mangle the words, especially to REM songs. (I mangle the words to songs all the time too, but it’s funnier when someone else does it). Now there’s a word for those crazy mishearings: a mondegreen. It’s a brand new word, or at least officially. The Merriam-Webster folks included it for the first time in their 2008 edition. As John Murrell over at GMSV says, we all need to do our part for this newbie noun. I’m thinking it’s going to be a bit of a challenge to work it into casual conversation, so I vote instead for submitting your favorite mondegreen to the Merriam-Webster folks for their collection. I’d put Wey Wey’s in for her, except I can’t remember any of them. I realized recently (when I put my finger on a rotary dial phone) that I still remember my 4th grade best friend’s phone number (thanks, that’s really helpful), but I can’t recall the words that split my sides in the early nineties. I sound old before my time, and let me make that impression worse by being even more nostalgic. As a word, mondegreen has arrived a bit late. The days when you learned the words to your favorite songs completely wrong are probably largely gone. Now we just look them up on the web. Yes, I realize people can still mishear lyrics and other spoken words, but the giant trove of absurd misquotes are the result of not being able to understand what the singer was saying, and just deciding to fill in the blanks, whether you knew it or not. I think the instant availability of the correct data has trained us not to bother coming up with alternatives; if it’s vague, just check it. Mondegreens: get ‘em while you can.